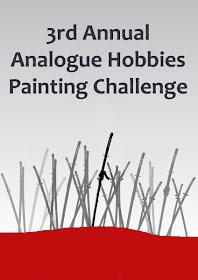 So I got my first entry in at last for the 3rd Annual Analogue Hobbies Painting Challenge over on Curt's wonderful blog. I'm rather chuffed as I have finally completed my fourth pike and shotte unit of my Royalist ECW army - Northampton's Regiment of Foote in green coats. I think I may have set my personal painting par for the challenge far too low at 500 points. The 24 ECW figs were worth 120 points on their own and I've just completed two command figures overnight, thanks to insomnia as much as anything. Both those and Northampton's foot will appear here in due course but they have a day of "grace" on Curt's blog before being published on my own. If you're interested you can keep track of my efforts here. Next up on the blog is the annual yearly wrap up and a few "plans" for 2013.